“Runner’s take your mark!” It’s that time of year again when hundreds and thousands of runners line Peachtree to run Atlanta’s annual July 4th Peachtree Roadrace. It is a day of celebration and festivities that culminate with the highly coveted and secretive t-shirt. From a physical therapy perspective it is the time of year that runners flood your clinic trying to get a couple of appointments in to get themselves bandaged up and to the Peachtree Road starting line. Sometimes the stars align and a little TLC from your favorite therapist gets you back out on the road, but unfortunately that is not always the case. One of those instances is the elusive hip pain that runner often suffer from. It can be frustrating to runners and medical clinicians alike, but often can be managed conservatively if caught early. Impingement seems to be the latest buzz when it comes to hard-to-diagnose hip pain. The reason being is that if the impingement is not caught early it can lead to the dreaded labral tear. Impingement, or more clinically labeled, Femoral Acetabular Impingement (FAI) is caused when the mechanics of the hip joint are altered so that the femoral head (the ball of the ball and socket joint) runs against the labrum (cartilage ring around the socket part of the joint). FAI is the most common form of hip impingement but the impingement can also occur anywhere around the ball and socket where a structure can be pinched as the hip moves through its range of motion. Commonly FAI occurs in athletes who participate in repetitive motions i.e. runners, or sports where there is a strong rotational component i.e. golf. In the case of the Peachtree, we tend to see an increase in hip impingement because oftentimes participants don’t spend the time slowly increasing their mileage and instead try to cover a lot of distance in a very short amount of time. This rapid increase in training intensity can alter the hip mechanics in which the dynamic balance between the smaller stabilizing muscles and larger force-producing muscles of the hip becomes more biased towards those larger muscles putting increased strain on the hip. Seeing your therapist to shift that muscular imbalance back in favor of the stabilizing muscles should enable the hip to move more freely and decrease the pinching. Be forewarned that surgery can be on the horizon if the increased friction goes unchecked and a tear in the labrum results. 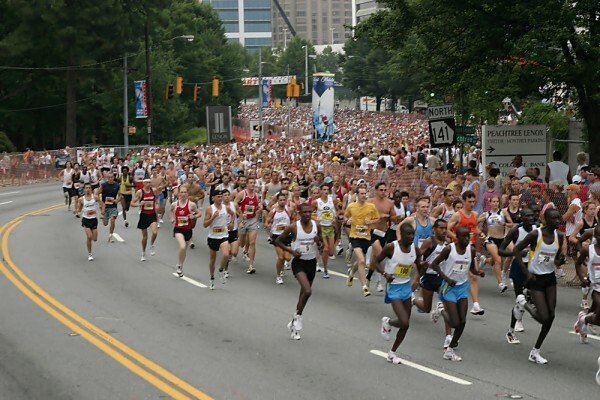 Take home message: enjoy the Peachtree Roadrace in all its glory from Cardiac Hill all the way to Piedmont Park, but don’t ignore that hip pain. In the right hands it can be diagnosed accurately and treated effectively.